Sour cherries from Malta Ridge Orchard & Garden in Saratoga County, New York. Picking fresh sour cherries on a beautiful morning in Saratoga County, New York, should be incentive enough to get out, but throw in cider donuts, free range eggs and local milk in an old-fashioned glass bottle, and the day becomes impossible to resist. Minutes away from my home, Malta Ridge Orchard & Gardens, owned by David and Robin Bowman, is an idyllic scene, the way a well thought out farm would appear – effortless and balanced, a closed loop full of life where nothing is wasted. What was originally an apple orchard was slowly turned over time into a multi-crop farm, with various berries, stone fruits and greens, ample ‘pick your own’ opportunities throughout the growing seasons, as well as their own naturally raised meats, eggs and baked goods. Don’t forget the positively addictive cider donuts, made with their own cider. I’ve been unable to resist myself from eating them before photographing on my several visits. Perhaps one day. Malta Ridge Orchard & Farms can be found at 107 Van Aernem Rd, Ballston Spa, NY 12020, at Saratoga Farmers Market on Wednesday evenings and Saturday mornings, and Spa City Farmers Market on Sunday mornings. Pitted sour cherries from Malta Ridge Orchard & Gardens, in Saratoga County, New York. Because these cherries are ‘fresh packed’ meaning still raw when hot processed, there will be some fruit float when finished. 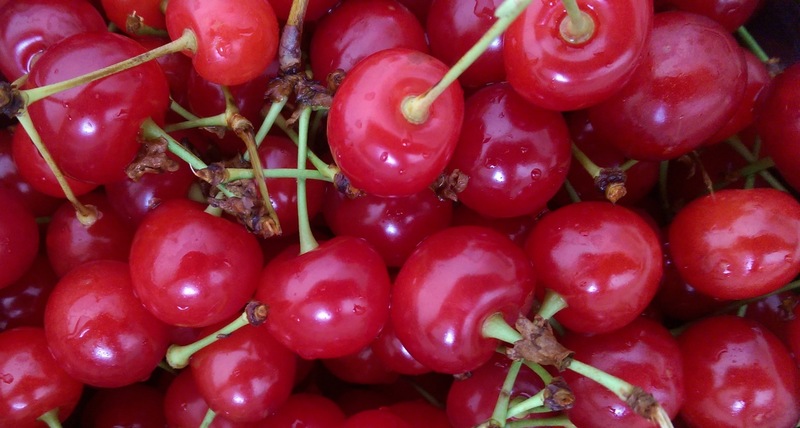 Pack the cherries tightly into jars without crushing them to prevent some of this float. Wash the cherries well, removing any leaves and stems. Pit the cherries, maintaining them whole as much as possible, and reserve any juice which may drain from them. 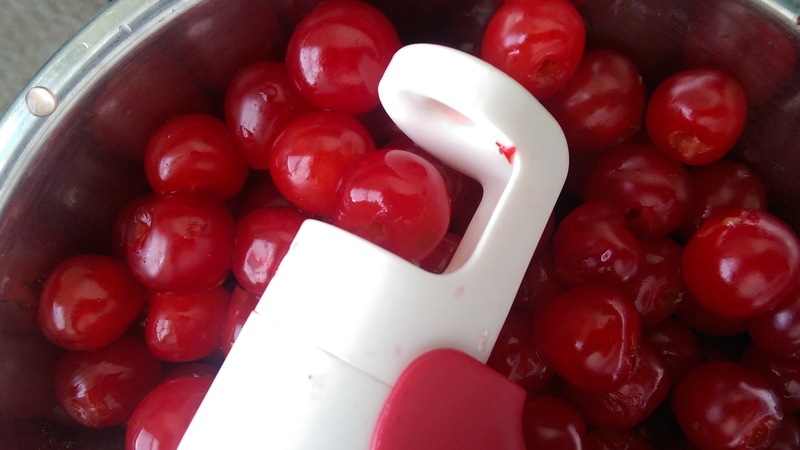 While cleaning the cherries prepare the syrup by bringing the remaining ingredients to a boil, reducing to a simmer and cooking until thickened into a syrup. Granulated sugar may be substituted for brown sugar (replacing by volume), but the caramel flavor of the brown sugar adds a depth to the syrup which will otherwise be missing. Pack the cherries tightly into hot sterilized 8 ounce jars. Pour in hot syrup, leaving 1/4″ of headspace in the jar. Use a clean skewer or knife to remove any air bubbles. Seal with sterilized lids and bands. Process in a hot water bath for 18 minutes. Like many preserved foods, the cherries are best when allowed to age after processing for a few weeks before using. They will keep for a year. 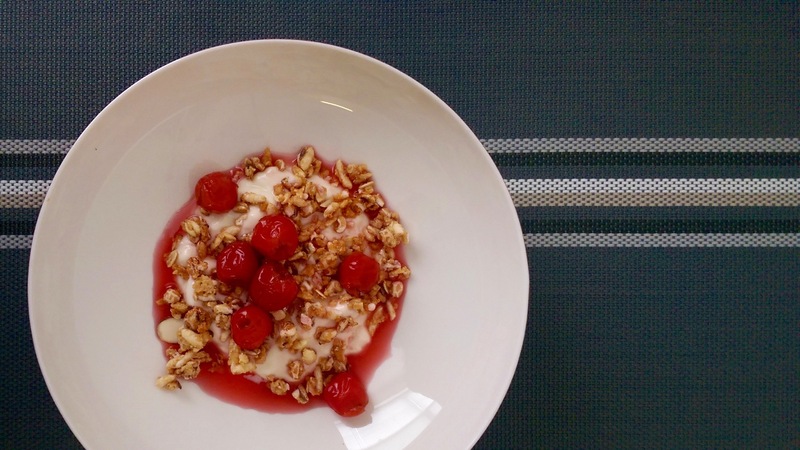 Preserved sour cherries over yogurt. Previous Post Are You Celebrating National Milk Chocolate with Almonds Day? I frequent Malta Orchard as much as I possibly can. Fresh asparagus on the stalk, local honey, fresh eggs…the list goes on and on. You can get a bunch of fresh herbs for $1.50 and a bag of fresh greens for a salad for only $3. No preservatives or pesticides. Delicious. What a gem. You should all support this farm. It’s amazing. I just purchased my Christmas tree from them too! Sorry, not asparagus, brussell sprouts. I love having the farm right near me, and really looking forward to their next u-pick season. Their sour cherries were fantastic.